All hail the mutant lavender crab! 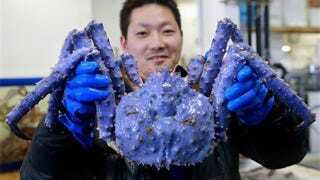 A Japanese seafood wholesaler found this lavender king crab in a shipment of regular king crabs. According to the company's president Kenetsu Mikami, this is the first time he has seen a crab of this color in 25 years. "It could be a good omen," he says. True. Or it can be a sign that the kaiju apocalypse is near, Mr. Mikami. The company put it on display either way. According to RocketNews, biologists in Hokkaido say that the cause of the coloration could be "the effect of its diet or possibly a mutation causing a lack of pigment."